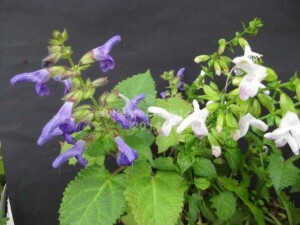 This Japanese plant is moisture loving as are most Japanese salvias and probably is generally best in part shade. Glabrescens has dark evergreen foliage and comes in a few colours which are not so readily obtainable in Australia. It has only been in Australia this century so is one of the newer ones. Most available in Australia is the purple and the pink and white. It can be really stunning in flower in autumn.